How to Make Mason Jars with Wire Hangers - Rustic Beauty for Indoors or Out - Recycle! I have always loved to reuse obsolete things, even if it means changing their intended use. creative crafts can be made using these simple jars. As a kid we used them for saving our allowances, they are pretty tough! If you have a box of them, then simply take the lids off and throw them in the dishwasher. Many people even use them for drinks as they are thicker and more robust than some beer mugs. You can decorate the outside of them or keep them simple. 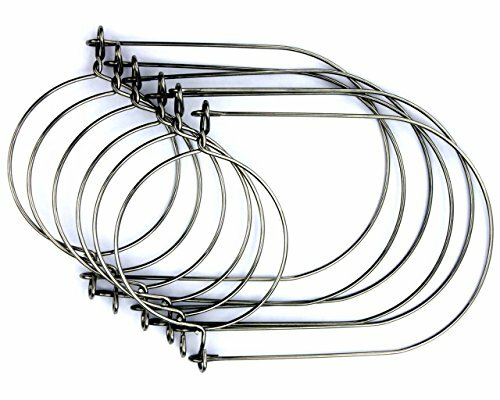 If you want to be able to light up your patio or yard for an event, then you will need to purchase the wire hangers that are designed to fit the neck of the these jars. These are not expensive and it makes it much easier to hang them from branches, hooks or wires you have strung up around your patio, creating retro “patio lanterns”. The handles on these wires make it easier to snap them around a branch to keep them safe and to show them off. You can place candles in them, or fairy lights, as many are battery operated now, so this can be a fun way to spruce up the patio outside or even inside on a dining table and stay safe. You can purchase these online, and you can also make them have double uses! Fill them with candles or fairy lights and hang them outdoors for that party or on your dining table for a cool centerpiece or swap the lid that comes with these for a drinking lid. A straw can be placed through the lid for your drinks. Cool for a themed party; get enough for centerpieces, drinks and lighting. 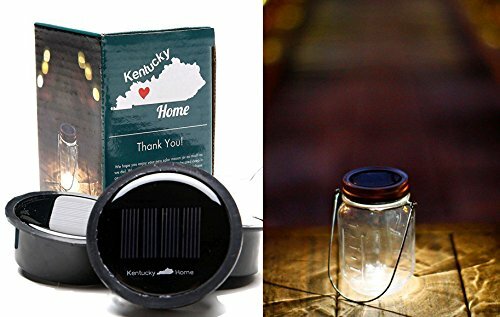 If you love the idea of these jars for lights, candles or just for a really cool yet rustic centerpiece on your table, you can get these solar lids that fit standard sized jars. I thought these were a cool idea for the outdoor setup. Simply swap the regular lid for these solar lids and leave the jar empty or fill it with some clear glass stones from the dollar store which would reflect and look cool too. Set it outside long enough to absorb the daylight and watch your patio or deck light up with the glow of these jars. If you have lots of jars, you could invest in a few of these lids, and these can be left outside all the time to add some warmth to your patio or deck as the lid seals. These look like fire flies to me when they are hanging in the yard and are pretty. 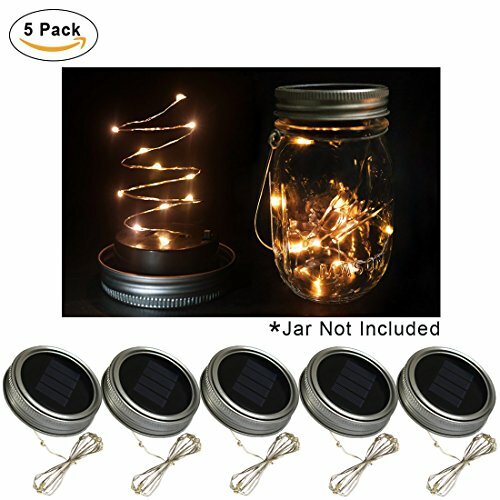 You simply stuff the entire string of solar powered tiny lights into a jar and then either hang it up, or use as a centerpiece for some warm mood lighting. This is the perfect way to reuse old jars. You could use any jar for this project, but there is something about those old mason jars, maybe their unique shape that just makes this project look awesome. If you have the jars there are so many options for decorating them and making them useful for lighting. 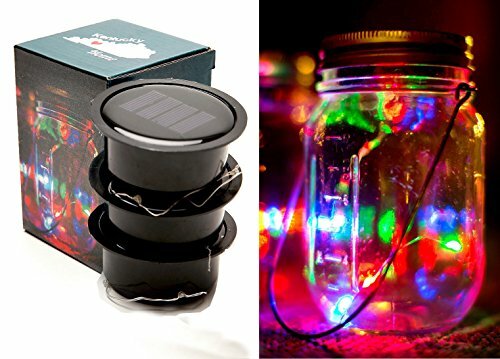 You can go simple with a clean jar and a tea candle in the bottom, or even a battery operated tea candle would work best, to solar lids, and then these really cool color changing fairy lights that come with the solar lid and you simply stuff them in the jar and then screw on the lid. If it is for a party or wedding, you will want to leave them outside for a day to absorb the lighting. They would also be really cool to hang under a patio umbrella or even on garden hooks out in the yard to add interest to your flower beds even after dark. A friend of ours used these for an outdoor wedding, and they not only looked good during the daylight as she decorated them, but at night they came to life. She had one at each table, as well as hanging around the buffet table and when the dancing started they gave a beautiful ambient glow. I have found these at thrift stores and especially at garage sales. If you are planning a wedding or a party start early and scour the sales and sometimes you will find boxes of them that no one wants but no one wants to throw away. 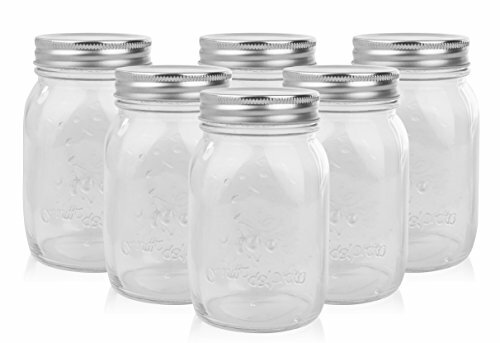 They may have slightly different shapes but the standard Mason jar has the same size lid. So just make sure you really inspect the area where the lid has to screw on (if you are using the solar lids especially) and if that looks ok with no chips, then simply put them in the dishwasher and give them a good clean, decide on what you want to use inside and then clip the mason jar wire hangers on them for branches, hooks and any hanging ones, and enjoy and pat yourself on the back for reusing something redundant for many people.